When I first began my research on the Grotto’s centenary in the early 1990s I went to the Rare Books and Special Collections in the Hesburgh Library concourse looking for source material I could not find in the University Archives or the library stacks. Being new to the university, the library and the campus were a whole new world to me. So I was a little ill at ease among the imposing shelves of rare books and the glass enclosed exhibits. Rita Erskine, a seasoned staff member of Rare Books and Special Collections, welcomed me with a special warmth on my first day there when I felt like a fish out of water. She quickly found just what I was looking for. Before I left we exchanged a brief get-acquainted conversation. Sensing my newness to my surroundings, that same day, she invited me to join her for lunch in the The Pit another new experience. The Pit was the library basement break room. Rows of bright yellow and black booths filled the room. A row of public telephone booths for the convenience of students, graduate researchers and campus visitors lined the back wall. A couple microwaves for warming lunch, and a wall of multiple vending machines for employees, students and visitors to take a quick lunch break, filled the rest of the area. The pleasing aroma of Microwave popcorn often filled the air and wafted up the elevator shafts from the basement announcing lunch time. It was a cozy spot to meet a friend and exchange midday conversation before returning to serious searching. Over the past ten years Rita has become a very special campus friend. She is the kind of person who collects people so we were often joined by other friendly staff members in the library. The Pit is now only a nostalgic memory and we meet instead in a converted meeting room on the concourse while library renovation is in full progress. One day when we were by ourselves, I was sharing with Rita a particularly unusual find I had come across in that serendipitous way that is so common to research. We both marveled at how often life surprises us with those unexpected special tidbits of information. She then began telling me a tale told to her by the former director of Hesburgh Library, David Sparks. The Rare Books and Special Collections have in their collection the papers of a leading American botanist, Edward L. Greene who was a close friend of another botanist and chemistry professor, Fr. Julius Nieuwland, CSC, whose library of books are also preserved in the Rare Books and Special Collections. Rita told me that, as the story goes, when Greene and Nieuwland walked the campus looking for specimens to collect, if a leaf was out of reach Fr. Nieuwland would just pull out his pistol and shoot it down. When I first heard it all I could do was grin, as I pictured in my mind this curious tale and wondered if it was really true. She went on to say, Mr. Sparks also told her the gun in question was still on campus, in Nieuwland�s former desk in the science building, and it had been kept there ever since. It so intrigued me at the time, I decided to make a side search to see if I could prove the gun actually existed and the story was true. Shortly afterward, Sharon Sumpter, Reference Archivist, at the University of Notre Dame Archives happened to come across the eye-catching note and illustrated poem, pictured below. It was written on birchbark and sent to the president of the university by Fr. Nieuwland in 1919. Sharon found it by chance when she was collecting materials for another researcher. Knowing my interest in anything creative or artistic, she set them aside to show me, having no idea of my current interest in Nieuwland nor how they would fit into my side search. A poem lovely as a bee. And bears a hatpin in his tail. But drones are always sons of bees. Greetings from the country of the muscalunge and White Birch. Have collected hundreds of specimens. It is a great botanical field and I had a wonderful time. Was lost several times, and got drenched yesterday in a tamarack spruce bog miles from anywhere. There are more mosquitoes here per cubic or square inch than anywhere I have ever been. PS: You can call these (other side) poems you may . . . [rest indecipherable]. The note and poem were sent by Fr. Nieuwland to Fr. John W. Cavanaugh, CSC the president of the University at the time. 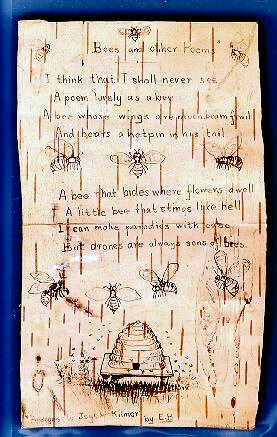 The illustrated poem titled Bees and other Poems was a parody on Joyce Kilmer’s Trees poem. I had just finished research on Kilmer and his association with the campus and this new material fueled my interest in verifying the story I had just heard about Fr. Nieuwland and Edward Greene. Below is Fr. George Schidel’s own account of the additional research he did and his impression of the birchbark note and poem Fr. Nieuwland sent to Fr. John W. Cavanaugh. Fr. 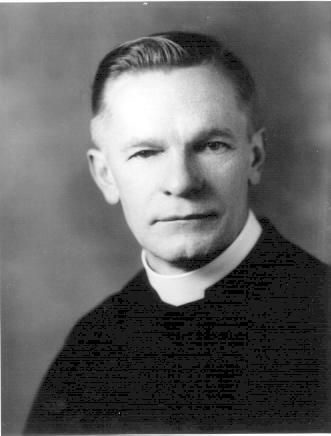 Schidel supplied this photograph of Fr. Nieuwland in his botanizing gear from his own photo album. 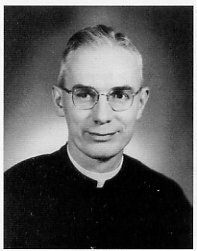 Ms. Sharon Sumpter, Reference Archivist, University of Notre Dame Archives, found a letter of Father Julius Nieuwland among the papers of Father John W. Cavanaugh. Cavanaugh was President of Notre Dame from 1905 to 1919. He went out of office on June 30, 1919. 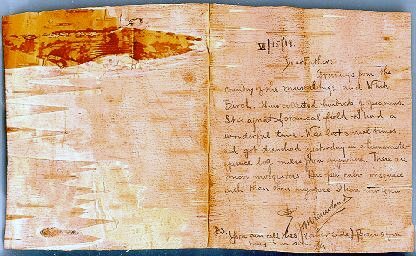 Nieuwland wrote the letter on birchbark. I learned of this letter through a mutual friend, Ms. Dorothy Corson. The archives provided this copy. All the allusions in the letter fit the Notre Dame Property perfectly. I thought it might have been written at Killarney Point. I did some checking in the Archives but did not succeed in finding any supporting evidence that Nieuwland had ever visited Martin Gillen at Killarney Point. [The Land of Lakes property in Wisconsin donated to Notre Dame by Martin Gillen .] I did find a letter written on August 6, 1919 to Nieuwland by Miss Sarah W. Phillips on Three Lakes Rod & Gun Club stationary asking his help in identifying a plant from that area in Wisconsin. She closed: ‘thanking you for what you have done for us before, I am . . .’ So Father may have botanized that area. At the suggestion of one of the librarians I got in touch with Ms. Barbara Hellenthal, Curator of the Greene-Nieuwland Herbarium at Notre Dame. She found a specimen dated June 16, 1919, the day after the date of Nieuwland’s letter to Cavanaugh. Nieuwland collected it at Squirrel Lake, Wisconsin. Squirrel Lake, is about ten miles west of Woodruff and just south of Route 70. The likelihood is that Nieuwland did all his botanizing there in 1919. He often camped out on botanizing expeditions. Why did he quote Fr. Eugene Burke’s parody of Joyce Kilmer’s poem, TREES, from TREES AND OTHER POEMS, on the other side of the birchbark? I think the postscript of the letter makes that clear. Nieuwland drew a mosquito above the word these and did the P of Poems to resemble a mosquito. Bees and mosquitos have something in common. They are both stingers, poems. Unfortunately the concluding two or three words of the postscript are unclear. Nieuwland decorated Burke�s parody himself. 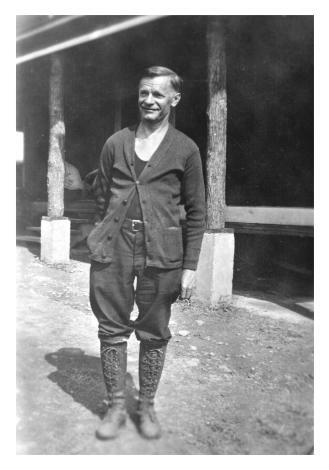 The photo of Nieuwland was taken at Holy Cross House on Deep Creek Lake in Western Maryland in 1932. He is dressed in his botanizing outfit. He was then fifty-four. He died in 1936. When next we met he told us, that indeed, Nieuwland’s desk was still there and Fr. Walter, the priest who now used it, said the gun was also there. His confirmation of the location of the pistol made me even more eager to find out more about it, but I was also a little timid about approaching a priest I did not know asking curious questions. I knew it was not a story I could in good conscience share in my manuscript which was focused mainly on the Grotto. So, instead I recorded it, adding it to what I began to refer to as my Wow Stories, because the first thing that came to my mind when I heard them was, Wow, what a story! I then put them in labeled folders to be filed with my general research source material. As time passed, I began to discover more and more of these little known human interest stories about the campus. They were such great stories about Notre Dame that I began to pass some of them on to Ed Cohen, the Campus News Editor for the Notre Dame Magazine. That way he could capsule them for the campus news section of the magazine, and they would have a larger life outside a storage box in the Archives. I had no way of knowing at the time that not only my journal of research, A Cave of Candles: The Story Behind the Notre Dame Grotto, the history of Notre Dame and the Grotto, was destined to be placed on the University Archives Website but also the complete stories behind these side searches that had beckoned to me along the way. Buried under books and papers in the bottom drawer of an old wooden desk in Nieuwland Science Hall is a small steel handgun, a Colt .25 semi-automatic, to be exact. Nieuwland is probably best remembered for his experiments with acetylene gas that led to the development of synthetic rubber by the DuPont Company in 1931. He taught organic chemistry at Notre Dame from 1918 until his death in 1936. But he also loved, studied and taught botany. He published a botany journal and also gathered thousands of plant specimens from all over the country. It was because of his botanical interests that Nieuwland sometimes carried a gun, says the pistol’s current owner, Father Joe Walter, CSC, head of ND’s preprofessional studies department. During specimen-collecting trips, if the leaf or limb Nieuwland wanted was out of reach, Walter says, he’d simply pull out the pistol and shoot it down. Walter was given the pistol 21 years ago by Nieuwland’s first cousin, the late George Hennion a former Notre Dame organic-chemistry professor who in his undergraduate and graduate student days at Notre Dame between 1928 and 1935, served as Nieuwland’s research assistant. When Nieuwland died of a heart attack in 1936, Hennion inherited several of his cousin’s possessions, including the gun. When Hennion retired in 1976, he passed the items on to Walter. He knew I was Holy Cross and a chemist and so was Father Nieuwland, so he figured he should pass it on to me, Walter explains. In addition to the gun, Walter acquired several other Nieuwland items, including the priest’s graduate degree from Catholic University, the nameplate from his office door, and approximately 30 cowboy paperback novels. Fittingly, the gun-packing botanist loved reading westerns. To my surprise, in reading Meghan’s story I learned that I had previously met Fr. Nieuwland’s Research Assistant, George Hennion -- the cousin who passed on Nieuwland’s gun, and other personal items to Fr. Joe Walter -- early in my Grotto research. It was George Hennion�s wife, Alice, who put me in touch with her own family�s connection with the Grotto. One of the people I interviewed during my Grotto research told me about Alice Hennion and how she often talked about her grandfather, James Braunsdorf, the architect who solved the initial problem of the collapse of the Grotto when it was being built. Without his expertise the Grotto might not have survived to celebrate its centenary. Alice Hennion passed on to me an early family photo of the Grotto to add to the Grotto Photograph Collection preserved in the University Archives. The day I stopped by to pick up the photograph she was not at home and her husband, George, entertained me with many stories about his life on the campus. He died shortly afterward. Several years passed before I learned that he was a crucial part of this story about Fr. Neuwland’s gun-toting field trips. 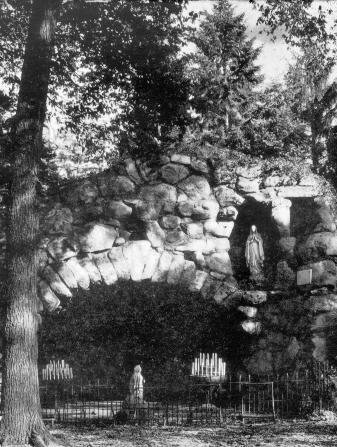 Alice Hennion’s old Grotto photograph, pictured here, was taken in the late 20s or early 30s during the time her husband, George, and Nieuwland, worked together. Through other information Alice Hennion later gave me, I was able to contact another descendant of Braunsdorf, the architect, who generously provided an impressive photograph of Robert Braunsdorf and his family to add to the history of the Notre Dame Grotto. It is now included, along with more information about the architect and builders of the Grotto, in Chapter 6 of my Internet manuscript, A Cave of Candles: The Story Behind the Notre Dame Grotto. All of which is just more evidence of the Six Degrees of Separation theory. We are interrelated and interconnected to one another in more ways than we will never know in our lifetimes.